*GPS accidentally got shut off when I stopped to change batteries in my camera and set my pack down. I didn’t realize it for 20 minutes/0.7 miles. Reconnected the track in the GPS editor software. My previous hike in July had left me with one more hike before I would reach the end of the FLT. I decided to leave that hike for the fall and hopefully get some great pictures with the leaves changing color. Since I was holding that hike for later I needed another section. The route on M28 had recently undergone a major change so I decided this was a good time to go back and work on that reroute. The entire reroute would take two hikes, but I could get part of it done this time. 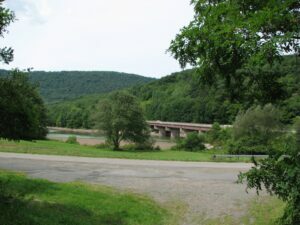 I left in the darkness of predawn and arrived at the Apex Bridge boat launch at the intersection of NY 268 and NY 10 in the early morning (mile 0.0 – 7:19 am). It was foggy and damp as I walked up road into the boat launch. The road had once been NY 268. I could see old girder posts in the brush that edged the road slowly being overgrown and fading into memory. Pieces of old pavement and the yellow center-line were still visible in places as well, but those too were disappearing. I crossed over the new NY 268 and walked a short distance up the road to find the FLT access point. I left the road and headed into the quiet dim shadows of the trail. After a short climb I came to a split in the trail with a sign indicating a vista a short distance away (mile 0.7 – 7:43 am). At the vista I could see the valley spread out below through a break in the trees. Fog clung to the hills as the weak sunlight tried to chase the it away. After a few pictures I went back to the trail and climbed up to the top. The area was rocky and looked as though someone had just dumped a load of flat river rocks all over the top of the hill. 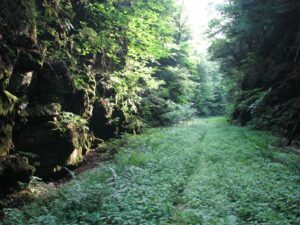 The trail wound along for a short distance before descending to the left and turning onto an old railroad bed (mile 0.8 – 7:48 am). What I saw next absolutely took my breath away. The railroad bed had been cut through the side of the hill and the rock walls rose above me. Fog had settled into the cut and the sun was beginning to shine through as a thin white beam making the fog glow. It was as if I had come to the doorway of some fantasy world and if I took a few more steps I would likely encounter elves, wizards, and dragons. I walked through the rock-cut marveling at the spectacle. After taking several photos I left the cut behind and continued to follow the old rail bed as it slowly descended down the side of the hill. It was an easy walk and I made good time. I passed by a rock that had been painted with a stick figure and the words “FLT 2013”. Further on I saw an old large concrete square lying down below the rail bed; I wondered what it might have been, but had no idea. At a few places the trail had to turn off the old railroad bed to avoid some washed out areas. At one such place I found a witness post and a survey marker. Another area that had been washed out had a wooden bridge built over the deep ditch to assist hikers in crossing (mile 3.7 – 9:08 am). After a long gradual descent down the old railroad bed, the trail turned left leaving it behind (mile 4.1 – 9:16 am). 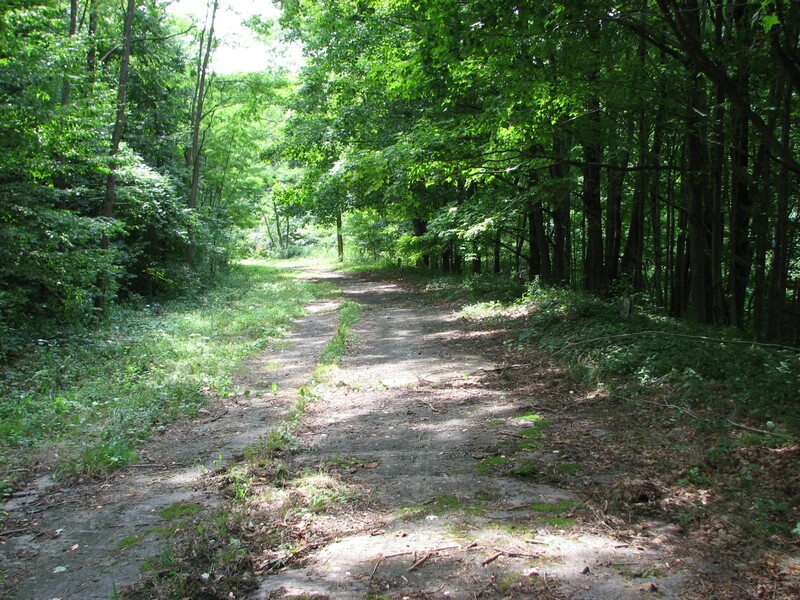 A short distance later the trail opened out onto old NY 10 (mile 4.2 – 9:19 am). 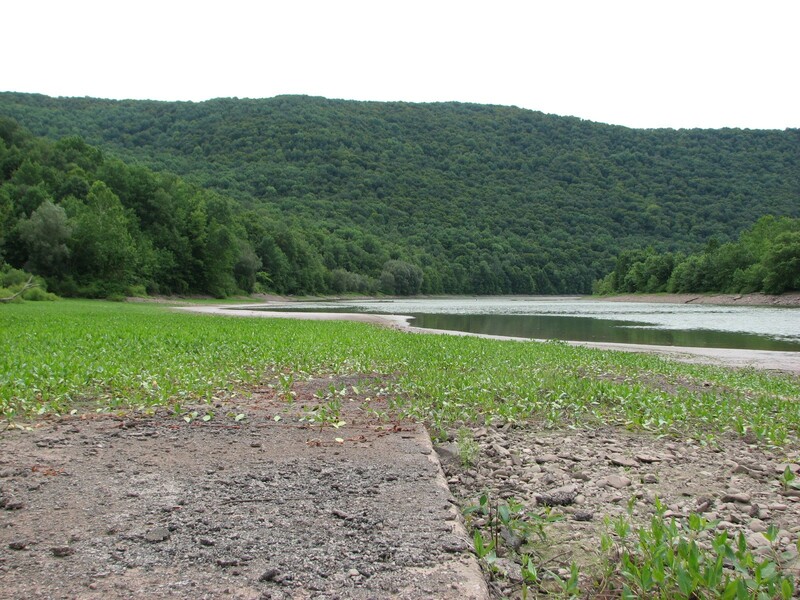 A new NY 10 had been built when the Cannonsville Reservoir had been constructed and much of the old route was now under water, but further upstream where I was the old remains could still be found. I walked along the old blacktop that was slowly being overgrown by brush and weeds. As I walked I could imagine families driving along the road on their way to a cabin or camping or maybe even just out for a Sunday drive. After another easy walk along the old blacktop I turned right and climbed up to Chase Brook Rd (mile 4.7 – 9:34 am). I turned left down the road for a short walk and then took a slight right onto a small logging road. 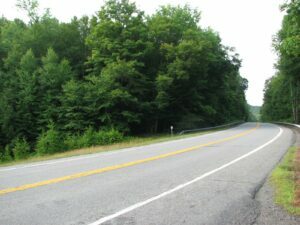 The road ran above Chase Brook Rd until nearing the intersection of NY 10 (the new NY 10). Here the trees that had screened the road from my view opened up and I could see a small parking area along Chase Brook Rd and a bridge over the West Branch Delaware River on NY 10 (mile 5.3 – 9:53 am). From here the trail turned back into the woods and wound along among the trees. After a while the trail began to head back towards NY 10 and eventually opened out onto the road (mile 6.1 – 10:16 am). 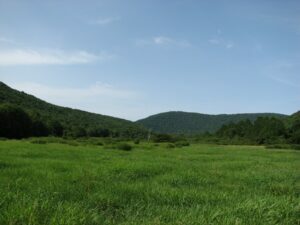 I crossed over to the other side and walked a short distance up the road before turning down a path that had been mowed through the tall grass growing at the shoulder of the road. The trail descended down and then turned left out into a large field. The path ran straight across the field. Once I reached the middle of the field I stopped to take some pictures (mile 6.3 – 10:23 am). I pulled my camera off my shoulder and found that the batteries had died. I took my pack off, got some new batteries and took my pictures. After taking my pictures I re-shouldered my pack and continued on across the field. I had only walked a few steps when I felt something winding around my foot. I looked down and jumped! I had stepped on a snake and it was curling around my boot. It scooted off as I jumped back, but left my heart beating loudly. After settling myself I continue on and this time made sure to thump my walking stick with every step to scare any other snakes off the path. I reached a small clump of trees at the other side of the field and once again found old NY 10. The trail turned to the right and followed the old highway. I could see the river to my left. I followed the old road for a little while and came to a parking area just off the new NY 10. The parking area allowed access to the river for fishing and there was a pickup parked here. 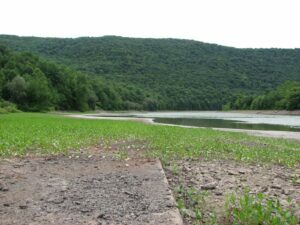 I walked up the dirt and gravel driveway of the parking area to the shoulder of NY 10 and crossed over to the other side (mile 6.7 – 10:35 am). 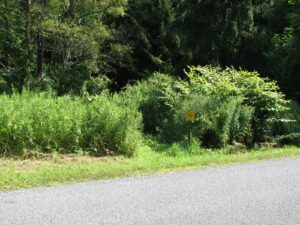 A path had been mowed through the tall grass at the edge of NY 10 and I followed it down before turning left into some trees. I decided to stop and take a short break in the shade of the trees. It had been warm out in the sun and I was ready to take a rest and get some water and a snack. After a short break I started out again and wound through a group of pine trees. The sunlight dappled the ground that was covered with old pine needles. The pine needles made for a springy path and softened sounds. I passed out of the pine trees and turned onto the old O&W railroad once again. The path was straight and easy to follow. Shortly after reaching the old railroad bed I decided to check my progress and found that my GPS was off. I later found that it must have happened when I set my pack down in the field to get fresh batteries for my camera. I had hiked about 0.7 miles before finding that it was off, so my numbers were off. I turned the GPS back on and continued along the rail bed. I came to a sign warning about the DEP shooting range ahead. It advised if I heard gun shots to detour around on NY 10 (mile 7.5 – 10:53 am). I stopped to listen and did not hear any sounds so I continued on. I finally came to Beers Brook Rd (mile 7.7 – 11:01 am). I had hiked up this road the year before when old route was a long road walk coming from the other direction. On that hike I had just walked up the road, but now the trail cut across the road and wound alongside it for a short distance. I crossed over and followed the trail. Not long after the trail turned back and rejoined Beers Brook Rd (mile 8.0 – 11:08 am) . I had reached my turn-around point and it was time to head back. I followed the trail back across Beers Brook Rd and then past the DEP shooting range. I came back to the mowed area at the side of NY 10 and crossed over to the parking area. From here I followed old NY 10 along the river. I saw some people fishing along the banks of the river. Before long I was crossing the large field where I had stepped on the snake; I made sure to thump my walking stick as I walked across. I climbed back up to NY 10 and crossed over and back into the woods. The trail wound along and then I was back at the small parking area on Chase Brook Rd (mile 10.7 – 12:14 pm). I continued following the logging road that ran above Chase Brook Rd before crossing over and back down onto old NY 10. I was beginning to get hungry and decided that I would take a detour and continue past where the trail turned off and follow old NY 10 to the river’s edge. 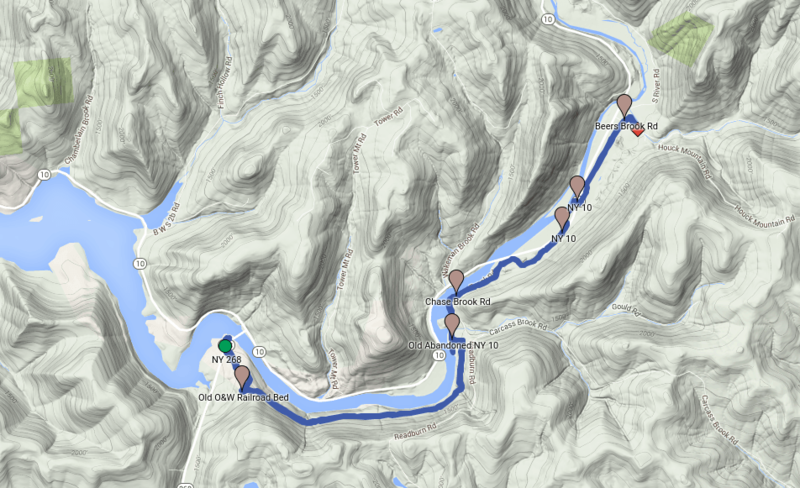 I reached the river and the old road continued on into the water (mile 11.9 – 12:42 pm) . I set my pack down and got my lunch out and took my boots off to give my feet a break. After resting for a while I pulled my boots back on and headed back to the trail junction. I turned right and headed back up to the old railroad bed (mile 12.3 – 1:18 pm). Turning right again I followed the old railroad bed back up toward the rock-cut. I passed over the wooden bridge and the survey marker again and past the rock with the FLT painted on it. Soon I was back at the rock-cut (mile 15.3 – 2:28 pm) . The fog was gone now, but it was still impressive. I took a few more pictures here and then climbed up out of the cut and back over the top of the hill. I descended down past the vista that I had stopped at earlier in the morning. I decided not to stop this time and continued on down the hill to NY 268. 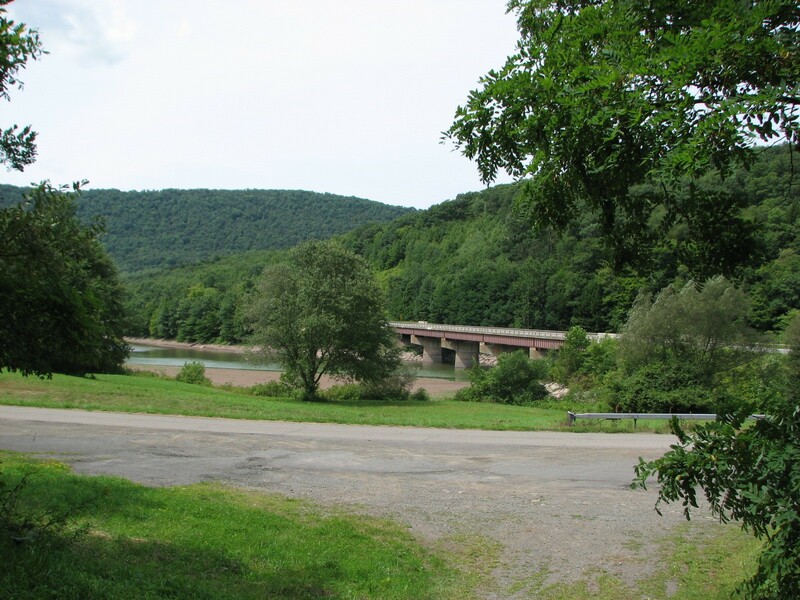 Soon I was crossing over NY 268 and walking down the old road to the boat launch and my car. I reached my car and removed my pack and traded my boots for sandals (mile 16.3 – 2:55 pm) . I had completed part of the new route for M28. The remainder I would save for another hike, which turned out to be a good plan as the route changed once more before I returned. I would hike the new section in September 2015 and it would take me up over a hill and past an old fire tower and some incredible views.